In the northern part of Romania, chicken soup has an old tradition and is highly appreciated in any season; it is served “with holiness” in almost every Sunday of the year and it’s “a must”at the festive meals in the family. At the weddings - almost obligatory! Shortly after the start of the business, when the news spread as at Huttons, in Botiz, there are the finest known noodles , the first special orders for the wedding appeared. As with such an event in the family, it is self-evident to put on the table the best dishes, "to keep mentioning your guests, and after that, the best thing to do is to make the best dough, mixing the best flour with 8 large fresh eggs; with no-added water! And as over the years "give me some THE Noodles for THE Wedding" has been repeated more and more, we decided that this is how the name "wedding noodles" will remain. 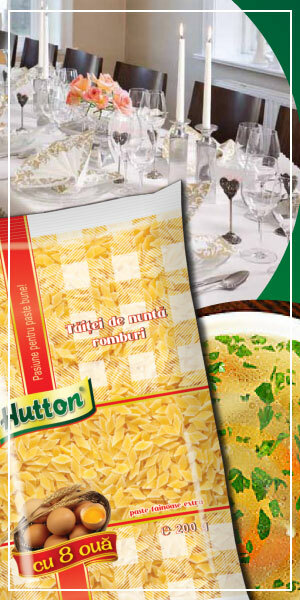 Currently, "Taitei de nunta" (Wedding Noddles) is a trademark of Hutton! "Wedding noodles" are also the most successful products among Romanians who are working temporarily abroad or are permanently moved to other countries (Austria, Germany, Spain, Portugal, the United States, Canada and even Australia) and who, on the occasion of their periodic visits to the remaining relatives in the country do not forget to go to supply, besides a bottle of fine “tzuica” and other local specialities, with something good, tasty, special like noodles,“from home”. And the fact that they sit between the luggage and carry our noodles at such distances sounds good to us and proves to us that we’re doing right what we’re doing. If you want to serve "Wedding Noodles" to your guests too, please contact us here and we will offer you a special price with home delivery! (Tip: For a medium-dense soup you’ll need 1 kg of Hutton noodles for every 30 servings).